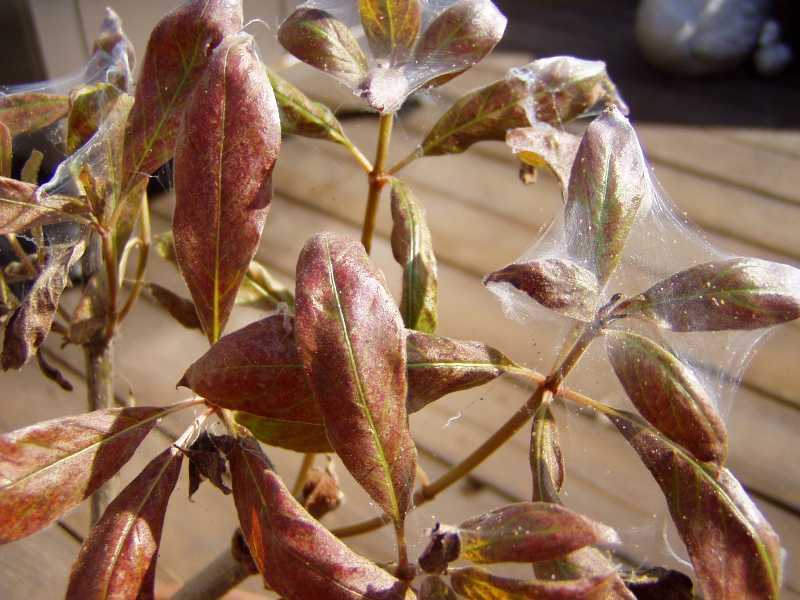 Spider mites are spiders, not insects. They have 8 legs; insects have only 6. Regardless, they are a serious pest both indoors and out. 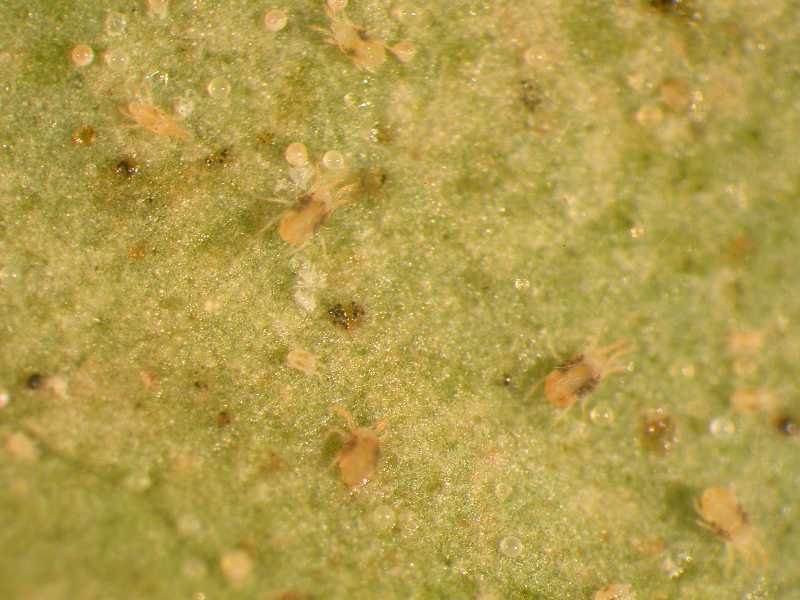 Spider mites are very small, only about 1/50 of an inch long, and so are difficult to see. They have piercing-sucking mouth parts for feeding on plant sap. They can multiply rapidly and in large numbers, cause leaves to take on a dusty, dull appearance. Leaves then yellow and drop or turn brown or tan. Since the mites are so small, the first sign is generally a plant that looks dull or in poor health. Leaves may appear stippled and curled. Fine webbing may also be evident under the leaves or between the leaf and the stem. When a leaf or branch is tapped over a white sheet of paper, small specks that appear as dust or pepper may be seen to move. 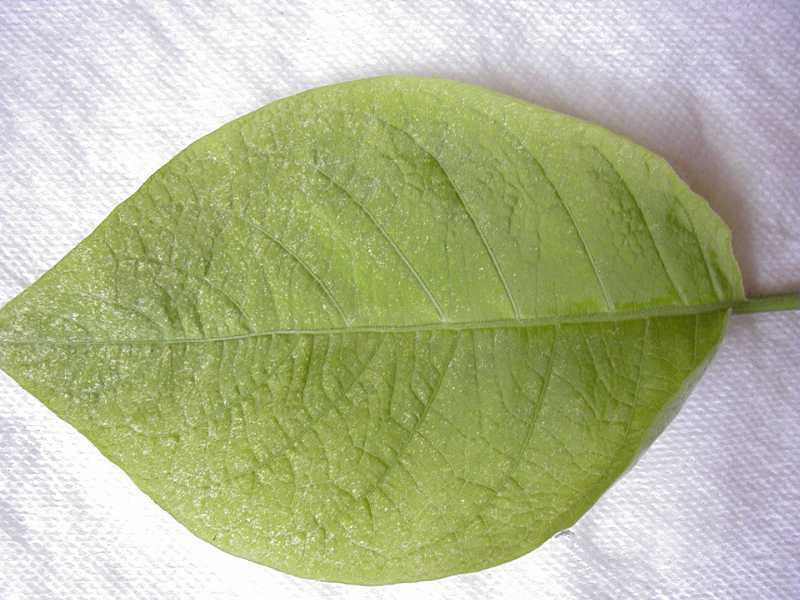 Spider mites can go from egg to mature adult in less than two weeks. Indoors as well as outdoors, several generations occur each year. 1. Remove mites. Dislodge as many mites as possible using a strong stream of water. Done on a regular basis, this can reduce populations dramatically. Wash the plants either outdoors or in the shower. Protect the soil so it is not washed out of the pot by the spray. 2. Use insecticidal soap. Many insecticidal soaps are also effective in controlling mites so check the label. Other soap products may actually be labeled as miticidal sprays. These soaps are specially formulated to kill mites and not damage plants. They can be very effective if used frequently until the problem is under control. 3. Use superior horticultural oil sprays. Highly refined oils sold as superior or horticultural oils are also very effective in controlling mites. The oil suffocates the mites. Unlike dormant oils, these oils are highly refined and under proper conditions, can be applied to plants in foliage without damage. Follow label directions to avoid damage to some plants that may be sensitive. Superior oils are also considered nontoxic and are less harmful to beneficial insects. When spraying indoors, protect surfaces that may be damaged by an oil residue. 4. Use chemical miticides. Many miticides registered for use indoors are available. Follow directions and if possible, spray out-of-doors or in a garage, weather permitting. Check label for control of spider mites. 5. To limit future problems, inspect plants regularly. With regular inspection, pest problems can be caught when just beginning and control is easier. It is also recommended to isolate newly acquired plants for 2–3 weeks to limit introducing pests indoors. Bringing plants indoors in the fall is another way of introducing mites indoors. Strategies 1 and 5 are strictly organic approaches. For organic approaches to Strategies 2 and 4, consult the Organic Materials Review Institute (OMRI™) for appropriate insecticidal soap and miticide products.